See who runs the HBF? 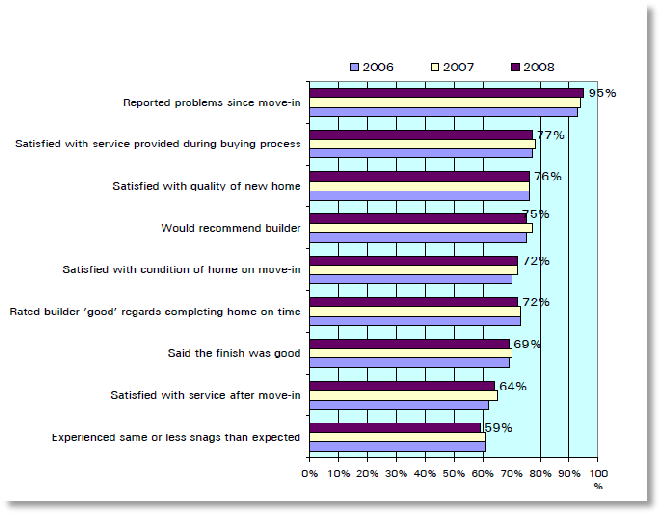 Why are there new home customer satisfaction surveys? The HBF intended to develop a "strategy to raise customer satisfaction in consultation with house builders." The three key elements being: a national survey of new homebuyers in partnership with NHBC; a Code of Conduct and a Customer Charter. "the voice of the home building industry in England and Wales. Our members deliver around 80% of the new homes built each year. We represent member interests on a national and regional level. More than ever before, the HBF is making a difference and delivering real tangible benefits that could be vital to the success of your business." Be under no illusion, the HBF represent the house builder's business interests - not those of the UK new home buyer. There is even a senior representative of a national house builder on the HBF board, Crest's CEO Steve Stone. Is the HBF survey representative? In 2007, the Office of Fair Trading (OFT) undertook a 'Home Building Consumer Survey' together with a market study of home building in the UK. This was instigated because it was believed that customer satisfaction had not improved substantially since the Barker Review of Housing Supply in March 2004.
issues around the sales process such as reservation fees, the clarity of information provided to homebuyers and potentially unfair terms and conditions in contracts. Differences in the timing of the survey in relation to the completion or move-in. The HBF survey was self-completed so results may be subject to greater negative bias from self-selection, completion errors and item non-response. The satisfaction scales used by the HBF have a 'neither satisfied or dissatisfied' or 'neither good nor bad' option. Given the value of a new home, it is unlikely that owner-occupiers will have no opinion on whether or not they are satisfied, although typically around 10% choose to respond neutrally. It is unclear how many homebuilders building more than 500 homes per year are not covered by the HBF survey results or whether the sample is even representative of all new homes built. Who carries out new home customer surveys? Since 2006, the HBF survey has been carried out by the NHBC. New homebuyers are sent the survey questionnaires by the NHBC, 8 weeks after legal completion. Around 60 house builders completing more than 300 homes per year are automatically included in the 8-week survey. However, the HBF say that the "survey is totally voluntary and there is no mandate to require house builders to take part"
The HBF 2017 survey report stated that 90,501 self-completion questionnaires were sent out by the NHBC. Of those, 52,290 (57.7%) were returned, these responses representing just 45% of the total 115,740 private sector new homes sold in England in the 12-months to 30 September 2016. It should be noted that only private housing is included in the survey, with 26,360 housing association and Local Authority new homes being excluded in the 29 March 2017 survey results published by the HBF. The NHBC ask house builders to submit address details for any new homes sold without NHBC warranty so they too can be included in the survey. From the number of surveys sent out, around 25,239 (22%) of private new homeowners did not receive the 2015/16 survey questionnaire. Previously the HBF National New Homes Survey; it was changed with the introduction of the Consumer Code for Home Builders. Participation in the survey is optional for builders completing less than 300 homes per year. This may explain why just 78% of privately-owned new homes receive the survey.